Soldier's Housewife - the "Hussif"
At the commencement of the Boer War in 1899, Victorian troops were issued with an item known as the Soldier's Housewife or more commonly called "hussif". 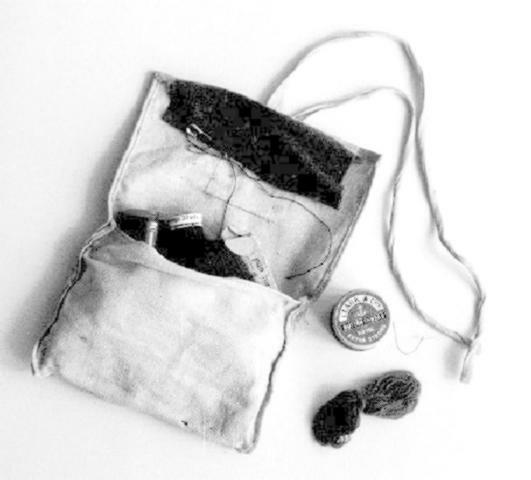 It comprised a small pack made of cotton and able to be rolled up, with contents consisting of some spare buttons, a couple of needles, some thread and other bits and pieces that soldiers used to make small repairs to the uniforms and kit. The Soldier's Housewife was roughly sewn from a rectangle of fabric, with one pocket, a needle-rest, and calico tape ties. It was so versitile and ideal for its purpose and very long-lived. Rolled up, it measured approximately 5.5" by 4". This was the first time in the Victorian military forces that the Soldier's Housewife was now standard issue for serving soldiers. Its use was obvious in repairing problems with clothing that needed repairing whilst in the field. It was a standard item in many armies and now it was finally part of the field equipment to be taken by the Victorian forces into battle. The name attracted a great deal of attention amongst the newspapers of the time. 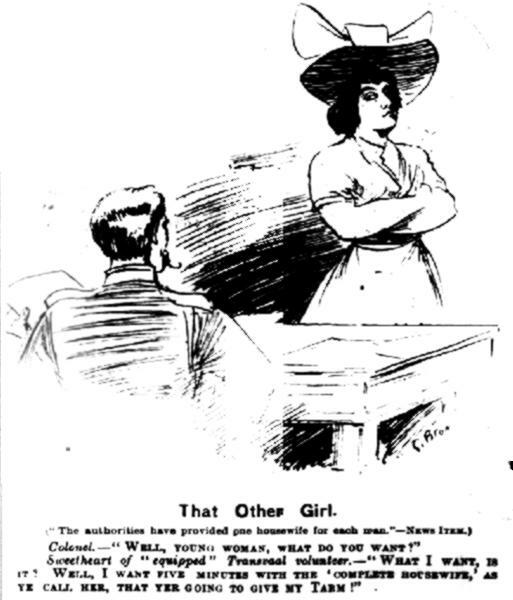 Below is a cartoon from the Melbourne Punch using the term as a double entendre. Cartoon from the Melbourne Punch, 12 October 1899, p. 353. Colonel - "Well, young woman, what do you want?" Sweetheart of "equipped" Transvaal volunteer. - "What I want, it? Well I want five minutes with the 'Complete Housewife,' ye call her, that yer going to give my tarm!" For the average soldier, it still survives in one form or another today. Citation: Soldier's Housewife - the "Hussif"